Author, Teju Cole, transcribes a trip to Nigeria after spending his life growing up in the States (New York, specifically). He takes not only his writing talent, but his observational and artistic talent as well, back to his birthplace and offers us a glimpse of what few people would notice. The noted contrast between cultures is not unlike what draws me into the writing of Jhumpa Lahiri, such as her novel THE LOWLANDS, which was shortlisted for the 2013 Man Booker Prize. Cole takes us into the heart of Nigeria, starting with the display of corruption from the ground, up. Everyone demands payment of naira for their services: crossing guards, ticket takers, grocers, etc. No payment could mean a denial of service or even bodily harm. Money, as describes Cole, is the social lubricant. And yes, those emails you get from Nigerian princes do come from Nigeria, are really the “yahoo yahoo” boys pecking out their letters one by one, under the nose of bribed police officers. 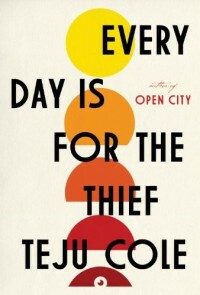 This story of Cole’s offers a shining thread of hope in the midst of disparity. Small, glimmering moments are noticed by him throughout. These moments could mean a woman reading literature on the bus, or a school girl learning to play classical music. Honest labored business is possible and does have potential to thrive. Beside the focus on violence, corruption, and poverty, I was particularly fascinated by the focus on religion. Cole describes both Muslim and Christian cultures, as well as a home that had practicing members of both faiths. It is interesting how so many seemingly opposite things coexist. The language of THE DAY IS FOR THE THIEF is simple and raw. Not all dialogue is separated by standard formatting, but often blended into Cole’s story. Well-framed photographs accent the story throughout. As a reader, you feel a definite presence of being along with him on his journey. My recommendation for this book would be to include a map of the Lagos area. Cole rattles off street names, city sections, and key areas; a map would help comprehension. I also wished to know more of what prompted this trip and his goals of being there, but that might just be my personal gaffe. Thank you to Random House Publishing Group for providing me with an electronic review copy of this book.